Leads available in 4 feet long, 3/8" or 5/8" wide. Same colors available as collars. One-of-a-kind, serpentine, gold-plated choke collars look stunning on all dogs. 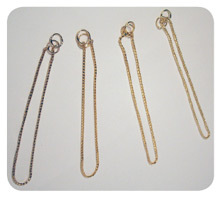 Heavier chain and/or chrome finish available - special order.